Ninebarks get their common name from their bark which peels back attractively revealing several layers; probably not as many as nine though! The genus comes from the Greek words for "bladdery" (physo-) and "fruit" (carpus-) and refers to the shape of the seeds. 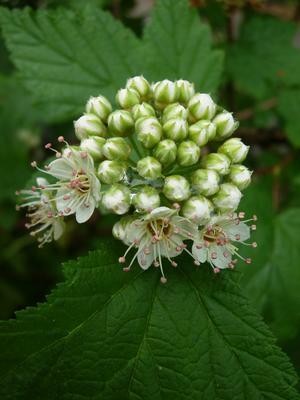 The specific epithet "capitatus," meaning "headed,"
Pacific ninebark is native to California, Utah, Montana and British Columbia. In California, it's found on slopes and along streams in the coast ranges and Sierra Nevada mountains in redwood forest, chaparral, red fir forest, yellow pine forest and wetland and riparian areas. 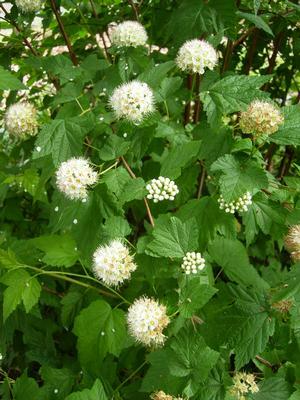 Pacific ninebark is an upright shrub with a V-shaped or slightly fountain-like shape. 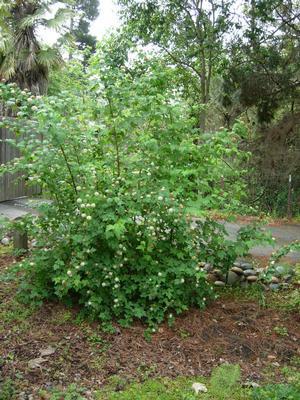 The foliage emerges in early spring and is a bright, fresh green. As the season progresses, it matures to a slightly darker medium green. The leaves are palmate and reminiscient of small sycamore or maple leaves. Most books and websites report that Pacific ninebark prefers moist soil. However, we've been growing several ninebarks in the garden here in Soquel since 2006 and they're all thriving with no watering other than rain. Little maintenance is needed except for occasional light pruning to maintain the desired shape.